Before the Spire Center for Performing Arts began drawing people to downtown Plymouth, Mass., the large spire atop the building was used to guide ships into Plymouth Harbor. Now, audiences and artists alike are sailing their way into The Spire for music, theater, dance and other performing arts activities. After three years and countless hours of work, The Spire received an overwhelming response to their opening night gala in early April with a sold out crowd. “From the very beginning, the community was behind this,” said Robert Hollis, president of the performing arts center’s board of directors. The Spire’s goal is right in its name: to inspire and aspire. The Spire has already been a draw for talented musicians, bringing in The Sea The Sea on opening night and Plymouth native and musician, Hayley Sabella, on April 18 for her CD release party. “It was an honor to have my CD release party there, and I have a difficult time imagining a more perfect place for folk music and performance art to take place” Sabella said. Along with playing regional, national, and local acts, The Spire will host theater about a third of the time. The intimate setting is also a unique aspect of the venue that musicians find appealing, Hollis added. As a long time musician and member of the arts community himself, Hollis is greatly invested in the arts in Plymouth. Over the last four years, Hollis has easily worked 80 to 100 hours a week to make The Spire what it is today, he said. 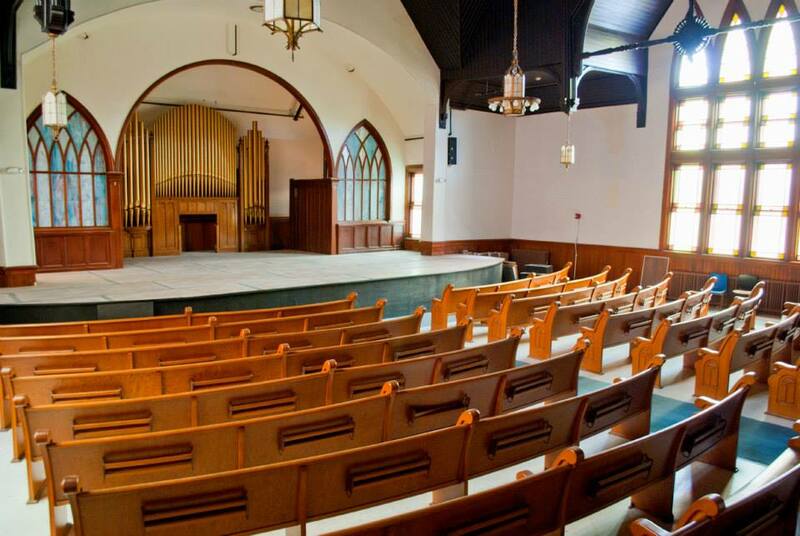 From renovations to generous donations, The Spire has come a long way and will continue to improve, Hollis said, adding that they will continue to put profits towards improvements to the sound system and outside renovations, such as repairs to the roof and steeple. Since the beginning, it has been a project for the community, Hollis explained. After receiving $360,000 from the town, $285,000 for renovations, Hollis and the members of the Plymouth Performing Arts Center raised an additional $120,000 for a state of the art sound system, bar, and expansive stage. They were able to expand the building three times its original size. Currently in the works is adding the ability to record the live performances for the musicians who play. This would give musicians the opportunity to sell live performance CDs of their concerts at The Spire. A performing arts school is in the works, as well. The goal for the performing arts school is to have a place where people can learn musical theater, acting, and most importantly how to apply what they are learning, Hollis said. The Spire is also proving itself as an economic draw for Plymouth by encouraging nearby communities to see shows in Plymouth and by encouraging Plymouth natives to spend more time in the center. As the former Beth Jacob Community Center, The Spire is more than an arts center and an economic draw for the town it is a historical preservation. The venue currently has performances booked through June, including a diverse line-up of pop, folk, jazz and theater productions. For more information about The Spire or to purchase tickets to upcoming events, visit http://www.spirecenter.org. EDITOR’S NOTE: Our publisher will present folk icon Tom Rush at The Spire on Friday, June 6, 2014, at 8 p.m. Tickets can be purchased HERE.